The history of sardin es go way back in time, but it was the emperor Napoleon Bonaparte who helped to popularize these little fish by initiating the canning of sardines, the first fish ever to be canned, in order to feed the citizens of the land over which he presided. Sardines are named after Sardinia, the Italian island where large schools of these fish were once found. Sardines can be enjoyed fresh, but they are most commonly found canned, since they are perishable. Sardines are rich in numerous nutrients and are an incredibly rich source of omega-3 fatty acids and vitamin D. Sardines have been found to support cardiovascular health. They are one of the most concentrated sources of the omega-3 fatty acids EPA and DHA, which have been found to lower triglycerides and cholesterol levels; one serving (3.25 ounce can) of sardines actually contains over 50% of the daily value for these important nutrients. Sardines are also an excellent source of vitamin B12, providing 137 percent of the DV for vitamin B-12. Vitamin B12 promotes cardiovascular health since it is tied to keeping levels of homocysteine in balance; homocysteine can damage artery walls, with elevated levels being a risk factor for atherosclerosis. 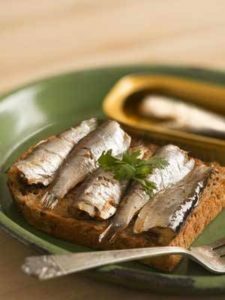 Sardines are a rich source of bone-building vitamin D. They contain 45 percent of the DV for vitamin D in each 3.85-ounce can. Vitamin D plays an essential role in bone health since it helps to increase the absorption of calcium. Sardines are also a very good source of phosphorus, a mineral that is important to strengthening the bone matrix. Sardines also provide 12 percent of the Daily Value (DV) for riboflavin, and 24 percent of the DV for niacin. It has been found that riboflavin may help prevent cataracts and migraines, and niacin may lower your risk for Alzheimer’s disease and improve arthritis symptoms, according to the University of Maryland Medical Center. The macronutrient content of these nutritious fish include for a 3.75-ounce can of sardines packed in oil: 191 calories, 22.7 grams of protein and 10.5 grams of fat, including only 1.4 grams of saturated fat. This is 16 percent of the daily value for fat, 7 percent of the DV for saturated fat and 45 percent of the DV for protein. Balsamic vinegar gives sardines a delightful taste. Make a sauce with extra virgin olive oil, lemon juice, pressed garlic, Dijon mustard and salt and pepper. Serve over sardines. Pan-fry whole sardines until crispy and mix with a warm salad of chickpeas, cherry tomatoes and parsley. Make a Greek-inspired mix of warm sardines, crunchy cucumbers, chickpeas and feta. Whole canned sardines are mixed with avocado, radish and watercress for a salad full of complementary textures and flavors. For a protein-packed and portable snack. Eat sardines on whole-grain Scandinavian-style crackers, such as Wasa, Ry Krisp, Ryvita, Kavli and squeeze lemon juice on top. For a sardine sandwich: 1 serving, mash 2 ounces lowfat cream cheese with 1/2 teaspoon onion powder, 1/4 teaspoon garlic powder and 1/8 teaspoon cayenne in a small bowl. Spread the mixture on a slice of pumpernickel and top with a couple of drained, canned sardines. For breakfast, revamp a favorite meal like an omelet or on top of a whole wheat bagel with sardines instead of smoked salmon.